as the “progressive” music scene. rom the local M&B brewing company in hope of getting sponsorship. was born 29th October 1944 and lived in Holcombe Road, Tyseley. that also included future Move drummer Bev Bevan (see Denny Laine and The Diplomats). Ray Thomas was born in Stourport on 29th December 1942.
he was the lead singer and harmonica player. Brian Betteridge and John Lodge who was born in Birmingham on July 20, 1945.
and had previously led his own group called The Rocking Tuxedo’s. and managed to become regulars on the Noel Gordon hosted Lunchbox television show. John Lodge switched to bass guitar when the band acquired Mike Heard as lead guitarist. in Germany but only Ray Thomas and Mike Pinder were willing to go and John Lodge wanted to complete a drafting apprenticeship. (not to be confused with Shadows drummer Brian Bennett’s band of that name) and went over to Germany from May to November of 1963.
and lived in Coventry Road, Small Heath, was playing drums in a group called Gerry Levene and The Avengers. The group also included Jim Onslow on bass guitar and guitarist Mike Hopkins who would later join The Diplomats. Gerry Levene was the stage name for Aston singer Micky Gibbs. For a short time, the Avengers lead guitarist was Roy Wood (see Mike Sheridan and The Nightriders). a group that was well known throughout the Midlands and also managed to secure a season at Butlins holiday camp in Scotland. they found the Birmingham music scene made up of bands that imitated either the Shadows or The Beatles. decided that R&B was the kind of music to play. so the name M&B Five was adopted, but the company was not interested so the initials were adapted to represent “Moody” and “Blues”. at London’s famous Marquee Club and shortly after, arranged a record deal with the Moody Blues signing to the prestigious Decca Records label. Their first single Steal Your Heart Away was a soulful effort and the b-side Lose Your Money, co-written by Denny Laine and Mike Pinder was an energetic though typical beat-style recording. Mike, Denny, Clint, Graeme, Ray. that would become a Moody Blues trade mark. “We tried to make it sound like gospel in our own limited way” said Denny. The song was Go Now and it became a worldwide hit for the Moody Blues in late 1964, reaching No. 1 in the British charts and also making top ten in the USA. This sudden success lead to many TV appearances and both national and international touring. and the Laine/Pinder composition From The Bottom Of My Heart which was also released as a single. there while the Moody Blues went to America on a package tour together with Peter & Gordon and fellow brummies The Fortunes. 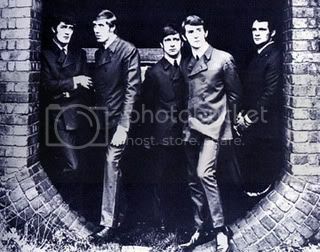 Despite the massive success of Go Now, subsequent singles by the Moody Blues had diminishing impact on the record charts and this was at a time when pop groups depended upon regular hit records rather than album sales for their survival. The Moody Blues’ self composed fifth single Everyday released in October 1965 only got to No. 44 in the charts despite its commercial appeal, and by 1966 the group were obliged to reduce their booking fees. Beatles manager Brian Epstein took over management of the Moody Blues in 1966 but this did little to improve the situation. By August, bass guitarist Clint Warwick who disliked touring had left the band and went back to Birmingham to work as a carpenter. Clint Warwick passed away in 2004. He was replaced temporarily by Rod Clarke who later joined The Rockin’ Berries. 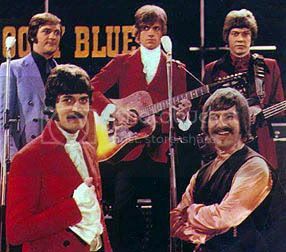 By late 1966, the Moody Blues were faced with the prospect of performing on the cabaret circuit to make ends meet. then went back to 50 pound a night on the road!”. along with former Rebels guitarist Mike Heard. Denny Laine’s position in the new Moody Blues line-up was filled by singer/guitarist Justin Hayward who came from Swindon. Mike, Ray, Justin, Graeme, John. Justin Hayward was born on October 14, 1946. He was originally in a band called the Wilde Three (with singer Marty Wilde) and had also recorded some singles under his own name although none of them charted. which was released in May of 1967 but despite airplay on pirate radio stations, the song failed to gain a chart position. The Moody Blues had changed their musical direction by early 1967 with Mike Pinder supplementing his piano with a Mellotron – a revolutionary and mechanically-complex instrument that used a system of pre-recorded tapes to create a distinctive orchestral/atmospheric sound and was forerunner of today’s modern electronic sampling keyboards. This, combined with group-written songs containing mystical lyrics and a classical feel, set them apart from the other pop acts of that time. They even included spoken poetry between the songs. (note: the Mellotron was developed and manufactured by the Bradley Brothers at Streetly Electronics in Birmingham. Mike Pinder also worked at Streetly Electronics in the early 1960s. Decca Records became interested in the Moody Blues’ new “progressive” sound and proposed an experiment where the group would record an album of classical compositions supported by a full symphony orchestra. recorded an entire album of their own music in just five days with the London Festival Orchestra. was released on the Decca subsidiary Deram label that was specialising in progressive music. thus gaining the band a foot-hold on the all-important American market. The album was to become a huge influence on many other groups for years to come. From the album came the Moody Blues’ classic single Nights In White Satin, written by Justin Hayward, and reaching number 9 in the UK, becoming their first top 20 hit since Go Now. Another single Tuesday Afternoon reached No. 24 in the USA and successful concert tours soon followed. 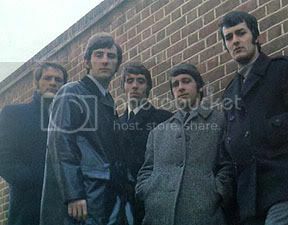 The Moody Blues’ next album released in 1968 titled In Search Of The Lost Chord was a major success on both sides of the Atlantic and it featured the songwriting efforts of all the group members. all the instruments themselves without orchestral backing. Voices In The Sky and John Lodge’s Ride My See Saw which both scored high chart placings. 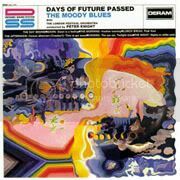 In 1969 the Moody Blues released the album On The Threshold Of A Dream which topped the charts in the UK and scoring high in the USA. The success inspired the band to form their own Threshold Records label and record shops. to make more top selling records. Keyboard player and founding member Mike Pinder left the group in 1978 and was replaced by Patrick Moraz. in terms of longetivity and international acclaim. as the rest of us regular guys. bopping to the bands, and remember one memorable night. appearing on the very week Go Now, reached No. 1 in the charts. with his double bass, and the drums packed under the bus stairs! so we’d hopefully obtain free entry to the club. I am 29 years old and was brought up listening to “The Moody Blues” as my dad was and still is a great fan. I have been to many of their concerts at the NEC and own most of their albums. I am searching for an album if any was done by “The Blue Jays” which is who “The Moody Blues” started as all those years ago. I think their music is brill and love every song they’ve ever produced. The Best Moody Blues with Mike Pinder. The Best Music in the Time by 1967-1972. Does anyone remember Tommy Steele. He was involved with Mike, Graeme and Denny in one of their earlier incarnations?